Jim Posey lowers the caboose top onto the waiting trucks. Workers set the trucks on the track to make certain they are the proper distance apart before the caboose is lowered. 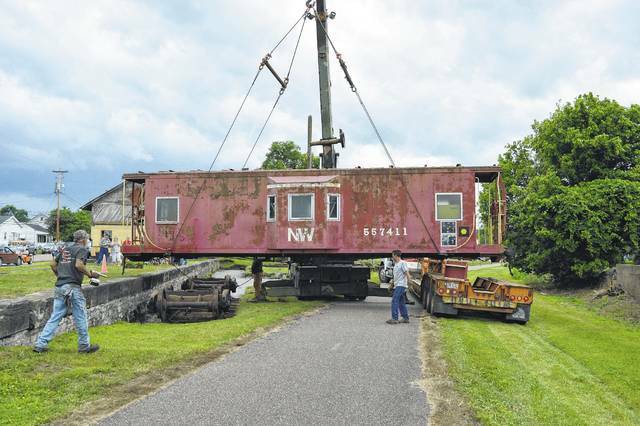 The caboose hangs perpendicular to the track and freight station before being moved into position for lowering. 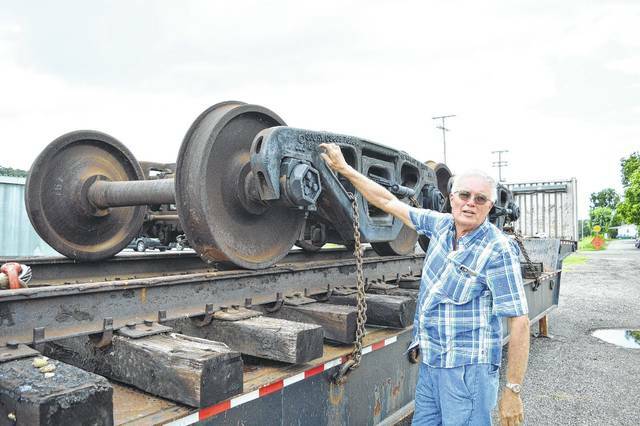 Vice President of the Gallipolis Freight Train Station Museum’s Board of Trustees Jerry Davis displays identification marks on the caboose’s trucks Friday afternoon. The identifying marks can be followed by train enthusiasts to determine the trucks lifetime use and origin. 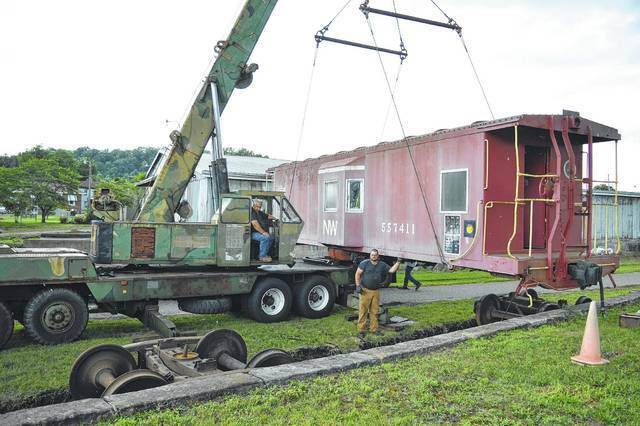 Jim Posey operates the crane as the top portion of the caboose is moved into place. 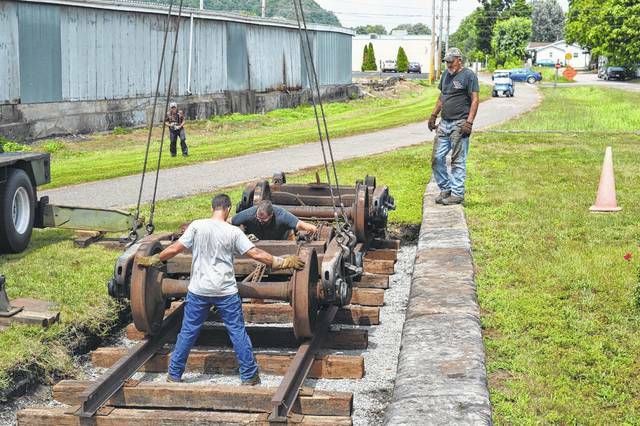 GALLIPOLIS — With the winter season pushing forward, the Gallipolis Railroad Freight Station Museum Board of Trustees is shoring up its spring rehabilitation plans for the roughly 115-year old building. Davis said the group aims to replace some of the interior wood in the office portion of the building in hopes of getting it in working order. Specifically, the board is looking for organizations that have experience in working with historical buildings in order to meet specifications to potentially be put on the National Historic Registry. The board will also need to determine the type of heating source it would like to utilize in the structure and where the equipment will be located. The museum is tracking down original Nelsonville bricks which were used to pave the walkways around the museum and have collected somewhere in the number of 850 pieces. “Once the interior is power washed and all, then there’s the possibility that we might be able to deal with the Star brick floor because the sand base it was originally on is still there,” said Davis. 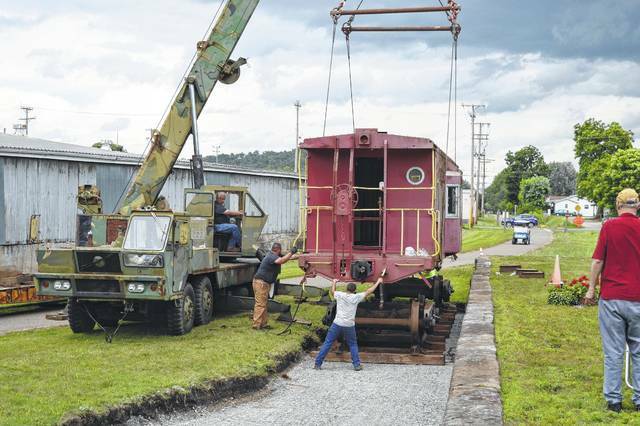 When the weather warms, the museum will place more railroad and ties and place a small steam locomotive on the track. President Jim Love first approached Gallipolis City Commission about turning the aging station into a museum in April 2016. According to him, the station was an old freight house and built in 1901 by Hocking Valley, a rail company of the time. The building at the time was roughly 115 years old and Love worked once as a telegrapher of the building. Davis and Love have thanked the community for its continuing support as the board continues chugging along in its efforts. Dean Wright can be reached at 740-446-2342, ext. 2103, and at the Gallipolis Daily Tribune Facebook page.